Answer: First we need to distinguish between north geographic pole and north magnetic pole since the two are not at the same location. The geographic pole is a point on the Earth’s rotation axis and is relatively fixed, though there is some wobble in the rotation. If you were at that pole and tried using a magnetic compass it would point to a location in the Arctic Ocean near Siberia some 575 km (350 miles) south of the geographic pole. That’s where the magnetic pole is currently located, and that’s the one that’s changing. 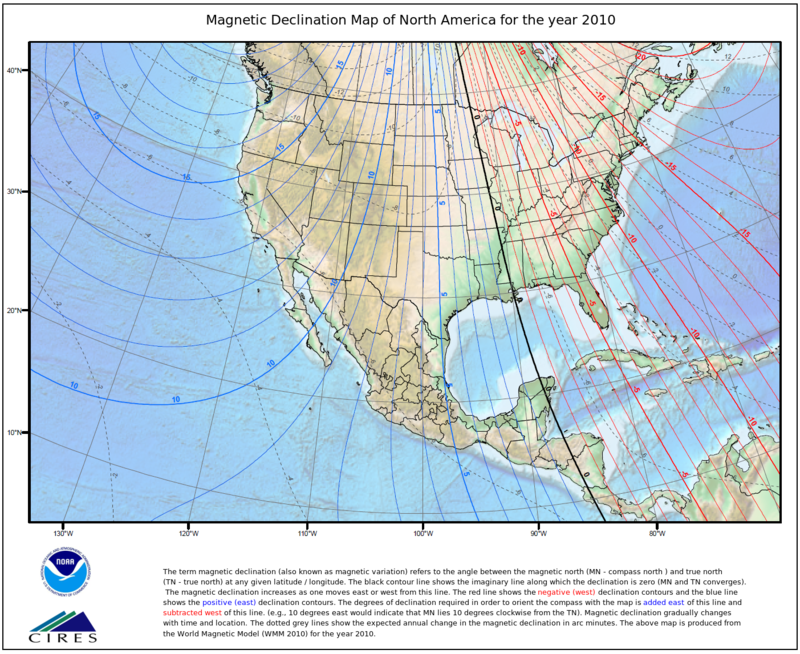 The difference in direction between geographic north and magnetic north is called magnetic declination. This varies from 0°–15° east or west over most of the United States. It’s around 11° east here in Arizona, and about 4° west in Milwaukee. You can see a map of declination here. In the arctic near the poles, declination can be much higher. In fact, it would be 180° if you were between the geographic and magnetic poles. Maps like that represent what is called the world magnetic model, and having it up to date is important for things like navigation and GPS. Normally that map is updated every 5 years, and was due for an update in 2020. But because of the rapid drift of the magnetic pole scientists decided they needed to update in 2019. Before we talk about drifting poles let’s review the current theory of geomagnetism. The main graphic shows how Earth’s magnetic field is generated. There is a region deep in the Earth called the outer core (depth 2890–5150 km) consisting of mostly liquid metal — primarily nickel and iron. Its temperature at the bottom, where it borders the solid inner core, is estimated to be 6000 °C. At the top of the outer core, where it borders the (mostly) solid mantel, the temperature is estimated to be 4500 °C. Because of this temperature difference the liquid metal circulates like water in a boiling kettle, with plumes of rising hot material and falling “cool” material. Plumes near the axis of Earth’s rotation more or less go straight up and down. But those nearer the equator are subjected to Coriolis forces. The speed of a point on the rotating Earth is greatest at the equator — 1670 kph (1037 mph). As you move toward the poles, or deeper into the Earth, that speed decreases linearly to zero at any point on Earth’s rotation axis. As a result, material rising through the outer core will feel a Coriolis force acting toward the west (opposite Earth’s rotation). 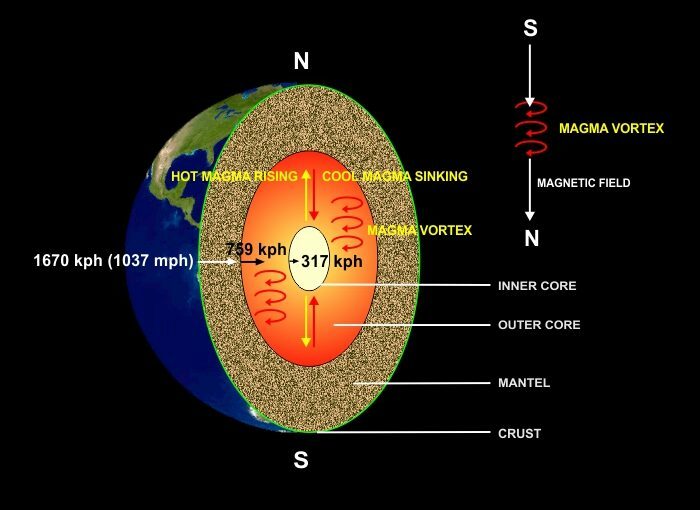 Because its tangential speed at the bottom of the outer core is 317 kph, as it rises through magma with faster tangential speeds it “lags behind” due to its inertia. This is why large weather systems rotate in opposite directions in opposite hemispheres. But in the outer core it gives rise to loops of circulating metal, and the electrical charges carried along that loop act as a dynamo. This generates a magnetic field, much like a coil of wire connected to a battery. I’ve known the location of the magnetic poles drifted over time, but had not heard until recently that the drift speed is increasing. Scientists don’t the details well enough to predict the drift, but think they understand why it happens. This drift is an ongoing natural process and doesn’t cause any problems as long as the “magnetic maps” (below) are updated occasionally. As regards the recent acceleration in drift, we have no idea why this is happening. There is one scary possibility. We can tell from the geological record that Earth’s magnetic field has reversed several times in the past. Having the north pole where the south pole used to be (and vice versa) is no big deal, except for requiring all the compasses to be relabeled 🙂 but during the pole reversal transition there will be a period of time when Earth will have zero magnetic field. And that is a big deal since the magnetic field shields us from a lot of solar and cosmic radiation. The magnetic “fossils” tell us we could be without a magnetic field for 200–10,000 years. On the other hand, there is some evidence that the Earth’s solid inner core has, over the eons, assembled itself into a single permanent magnetic crystal. If this is the case, then even during a field reversal there could be some residual field to protect us from incoming radiation. Sharp eyed readers may have noticed that the magnetic field generated by the “coil” in the top graphic is in the opposite direction as Earth’s, with magnetic south at the top. Based on the direction of rotation, and using the right hand rule for electromagnetism, the south pole is indeed at the top. Fact is, what we call the “north pole” of the Earth is really a magnetic south pole. 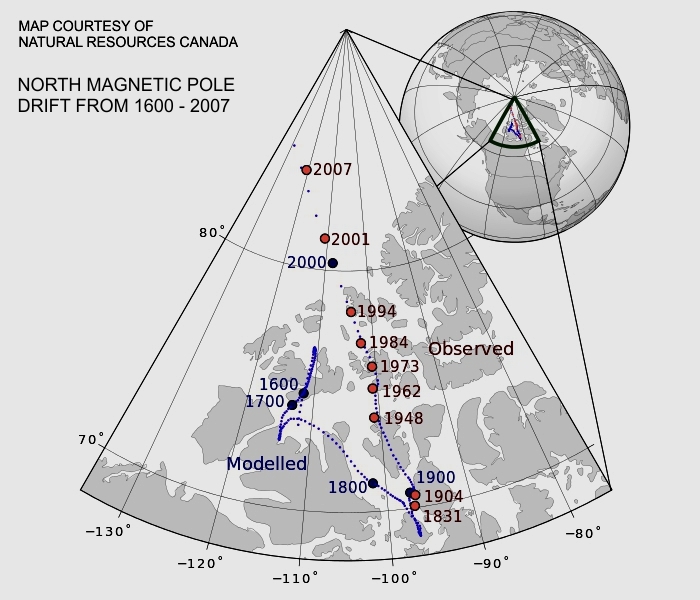 The concept of a geographic North Pole predated our understanding of magnetism, so the name stuck.